“Shipping in the English Channel” by Charles Brooking, circa 1755. Oil on canvas, 35½ by 46-3/8 inches. Yale Center for British Art, Paul Mellon Collection. This painting, by one of Mellon’s favorite artists, depicts the Downs, a spot off the Kentish coast where a sheltered anchorage meets dangerous, open sea. NEW HAVEN, CONN. — Its original fittings mostly intact, a monumental ship’s model makes a splashy appearance in the opening gallery of “Spreading Canvas,” the sweeping survey of Eighteenth Century British marine painting that continues at the Yale Center for British Art (YCBA) through December 4. 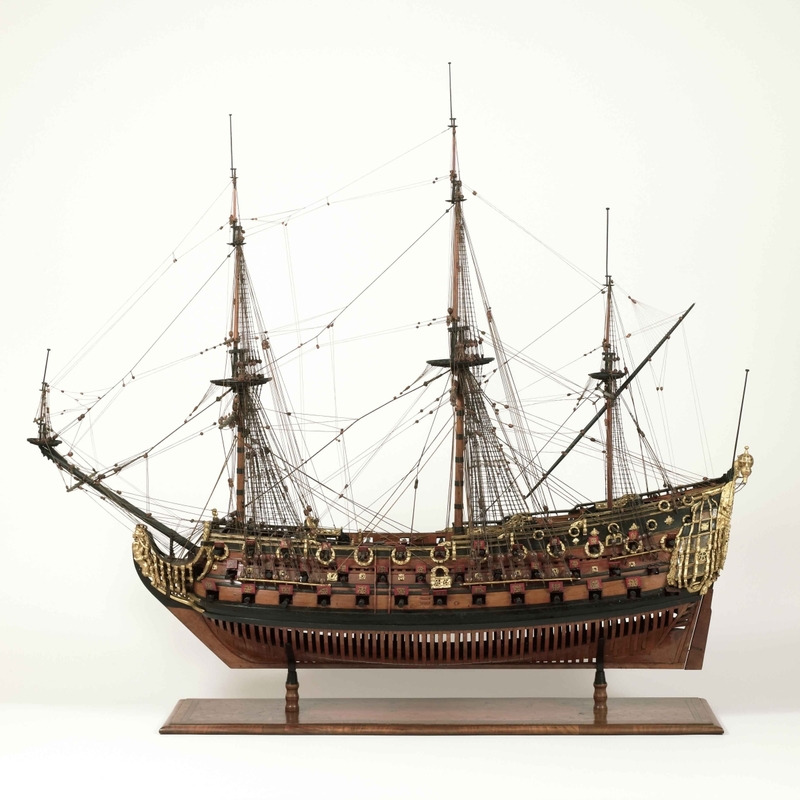 Made in 1677 in anticipation of the launch of the ship Coronation in 1685, the year James II ascended to the throne, the model, just over 4 feet tall, passed from the Earl of Carbery to Sir Richard Gough Kent and was later sold by the dealer Max Williams to the American collector Junius S. Morgan Jr. The ship it heralded had a much shorter life. Its wreckage lay on the ocean floor off England’s south coast for nearly three centuries before being discovered in 1977. Another salvage operation is underway in New Haven, orchestrated by Eleanor Hughes, a former YCBA curator now with the Walters Art Museum in Baltimore. In her ambitious exhibition and accompanying catalog, Hughes takes a revisionist look at British marine art, urging that the paintings on view be read not through our own post-Romantic lens, but as the carefully constructed art objects and social narratives they were meant to be. To help tell the story, she enlists prints, drawings, logbooks and commemorative medals and ceramics. In organizing “Spreading Canvas,” YCBA returns to a subject it embraced in the late 1970s in “Seascapes,” mounted soon after the museum opened and drawn from the collection of its founder, Paul Mellon. Of the 49 works featured in “Seacapes,” 13 reappear in “Spreading Canvas,” whose other major lender and co-organizer is the National Maritime Museum in Greenwich, London. The broad outlines of the story are this: the British imported the conventions of marine painting from the Dutch in the late Seventeenth Century. Within a few decades, Britain developed its own tradition, one that sought to project imperial power and glorify those who wielded it. New artistic preoccupations took hold after the Battle of Trafalgar in 1805. Hughes assimilated four decades of new scholarship grounded in artistic networks, postcolonial and transoceanic studies, and institutional histories. Hughes writes of the art world’s disdain for marine painting, possibly news to fans of the American painters Fitz Henry Lane and William Bradford, or the Anglo-American James Buttersworth, to name but three practitioners. A bias against marine painting can be detected as early as the late Eighteenth Century, she says, in the lectures of Royal Academy of Arts president Joshua Reynolds, who elevated history painting and argued for the primacy of the human figure, necessarily diminished in most marine scenes. Ultimately, Hughes does not so much defend marine painting as ask contemporary viewers to understand the context in which it arose. Critics aside, marine painting flourished in Britain because the public liked it. The marketplace and its influence on painters and painting is a thread Hughes weaves skillfully, and colorfully, through the length of her tale, from the earliest royal commissions to the disseminating influence of shows mounted by the Royal Academy and other exhibiting organizations. An opening gallery reviews the contributions of the progenitors, both named Willem van de Velde. Having worked for the Dutch state recording the first and second Anglo-Dutch wars, father and son came to England, taking up residence at the Queen’s House in Greenwich. The Dutchmen were enormously influential. British artists collected their precise and accurate drawings. Engravings of their work were printed well after the death of the Younger — admired for his accomplished use of color, fetching compositions and skill in rendering atmospheric effects — in 1707. 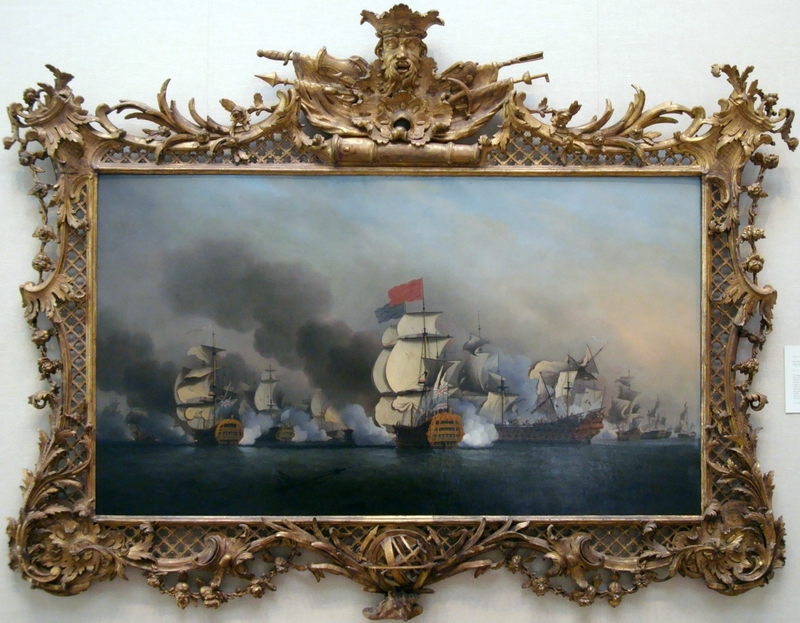 An adjacent gallery surveys the first native-born British marine artists, some of whom — Samuel Scott and Peter Monamy among them — were inspired by Admiral Edward Vernon’s 1739 victory against the Spanish at Puerto Bello. The story of the admiral’s capture of the Panamanian trading post gave British marine painters their first chance to depict a British naval victory, the glory of which was also commemorated in prints, ceramics and medals, and preserved in the name Portobello Road. Keen on promoting British art and artists, William Hogarth, to whom the exhibition’s title alludes, gave marine artists, a distinctive category in England by the late 1730s, their first public exposure when he placed their work in the supper boxes at Vauxhall Gardens, a public entertainment venue on the south bank of the Thames, and in the Foundling Hospital in the mid-Eighteenth Century. “An English Royal Yacht Standing Offshore in a Calm” by Peter Monamy, before 1730. Oil on canvas, Yale Center for British Art. 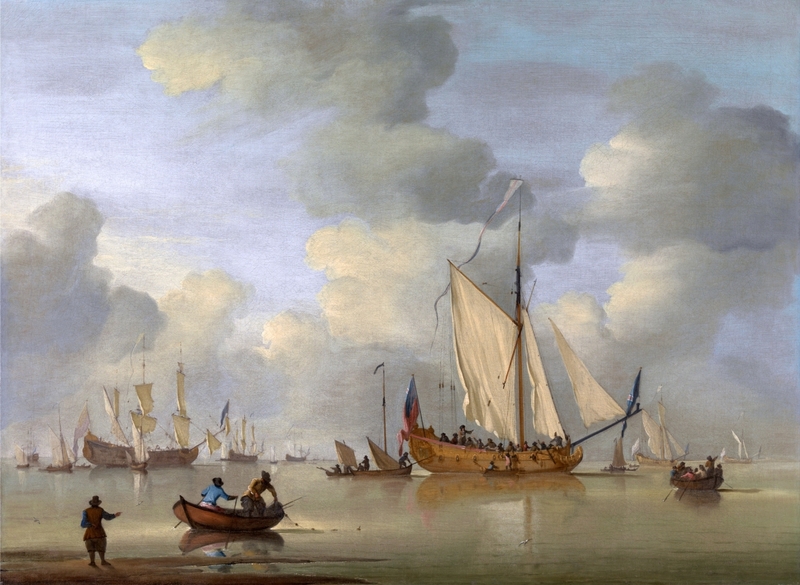 Scholar Pieter van der Merwe describes this work as an English capriccio in the Dutch tradition, noting the incongruous presence of English vessels in placid waters more resembling the sheltered Zuyder Zee than the choppy Channel. One of many charming stories unfurled by Hughes involves Charles Brooking, a talented marine painter who labored in obscurity until the Foundling Hospital’s treasurer, Taylor White, happened upon his work in a shop window and advertised to meet the artist, whose identity Brooking’s unscrupulous dealer had labored to hide. As the tale goes, Brooking painted the monumental canvas “A Flagship before the Wind under Easy Sail” in situ at the orphanage because his own studio was too small. On loan from London’s Foundling Museum, Brooking’s canvas is a star of the show. After Admiral George Anson’s 1747 victory over the French off Cape Finisterre, Anson’s wife, Elizabeth, gathered paintings, prints, a ship model and a book containing maps and charts together in a tribute to the hero at the family seat, Shugborough. Hughes and her colleagues relished the opportunity to recreate this shrine, complete with Lady Anson’s letter describing the project to her sister-in-law. As an aside, some picture frames in the YCBA show are themselves masterpieces. One, surmounted by a bust of Neptune and possibly by Isaac Gosset, surrounds Samuel Scott’s 1749 oil “Vice Admiral Sir George Anson’s Victory off Cape Finisterre,” a centerpiece of the Shugborough re-creation. Of special interest to collectors of Asia Trade views, “Spreading Canvas” delves briefly into Eighteenth Century British depictions of far-flung ports and coastlines. Drawing skills were expected of officers, whose renderings sometimes served as navigational documents. 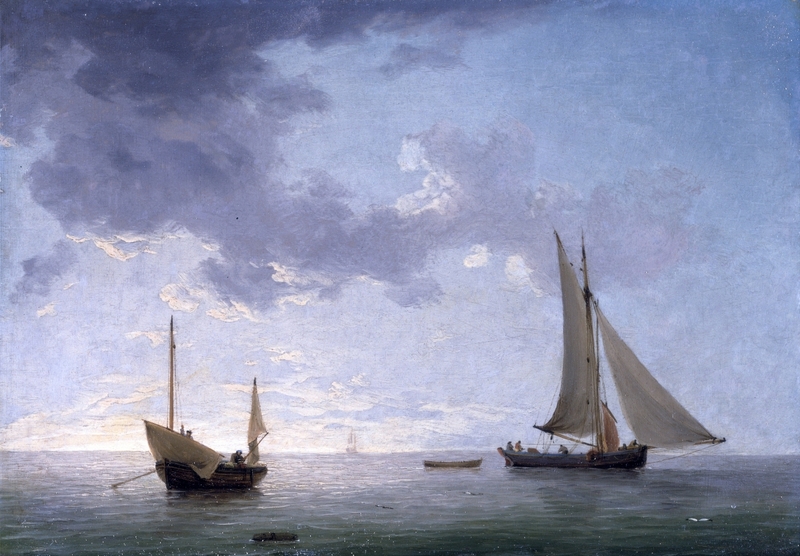 Intriguingly, more than a few successful marine painters began their careers as sailors. One of the most accomplished was the French-born Dominic Serres, a merchant seaman. Brought to London as a prisoner, Serres became a painter and, later, a founder of the Royal Academy. 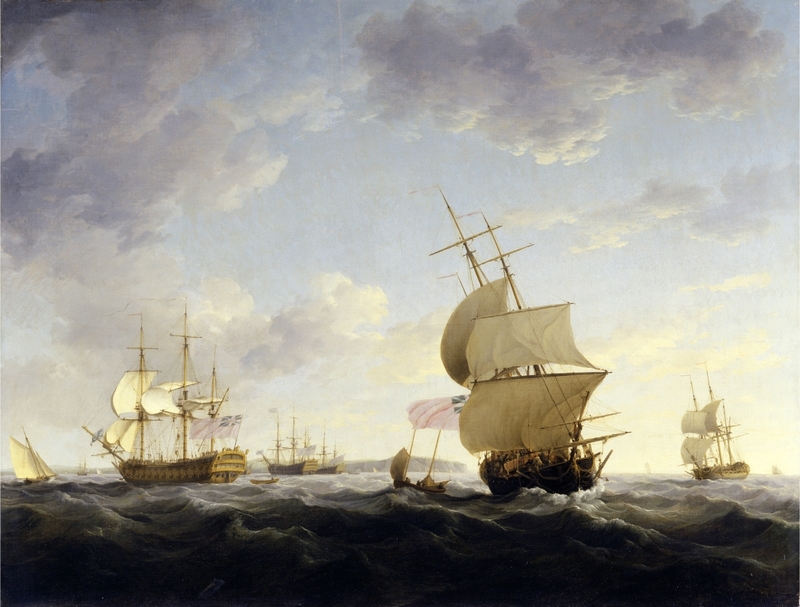 If marine painting helped the British visualize their role in the world, public exhibitions, organized annually from the 1760s, broadcast the message. It helped that the Royal Academy shared space at Somerset House with the Admiralty. Important military engagements, particularly during the American War of Independence, stimulated the painterly imagination. As a percentage of works on view, marine scenes peaked at the Royal Academy in the 1780s. In another impressive bit of stagecraft, YCBA recreated part of the 1784 Royal Academy show, hanging works by Robert Dodd just as they are depicted in a contemporaneous drawing by Edward Francis Burney. 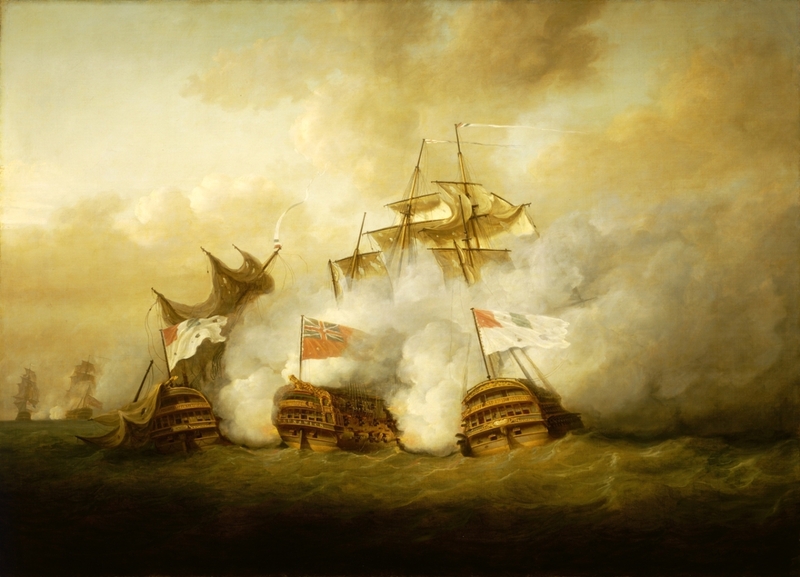 “His Majesty’s ship the Brunswick Engaging the Vengeur on the First of June” by Nicholas Pocock, 1795. Oil on canvas, 54-1/8 by 74¾ inches. National Maritime Museum, Greenwich, London. The Battle of the Glorious First of June was the first major fleet engagement of the French Revolutionary War. In Pocock’s depiction, the attacking Brunswick, center, outguns the Vengeur and a second French ship, the Achille. A fitting coda, on loan from the Walters Art Museum, is John Scarlett Davis’s 1830 depiction of the interior of the Painted Hall at Greenwich Hospital. It offers a view of Britain’s national collection of maritime art in its infancy, the stars of which, miraculously, are for a brief time in New Haven. Published by the YCBA in association with Yale University Press, an accompanying catalog offers a layered analysis of a complex subject. Edited by Hughes and the culmination of many years’ work, it features essays by Hughes, Richard Johns, Christine Riding, Catherine Roach and Geoff Quilley, plus entries by Sophie Lynford, John McAleer and Pieter van der Merwe. YCBA has also mounted a small but vibrant companion show of the art of Yinka Shonibare, on view through December. Organized by Martina Droth, the museum’s deputy director of research and curator of sculpture, the homage to Admiral Nelson arrays an outsized ship in a bottle, a maquette for Shonibare’s fanciful installation in London’s Trafalgar Square in 2007; costumes of Dutch wax-printed cotton by Shonibare; and paintings from the Anglo-Nigerian artist’s “Fake Death” series. The Yale Center for British Art is at 1080 Chapel Street. For information, 203-432-2800 or www.britishart.yale.edu. “Men-of-War and other Shipping on the Thames” by Samuel Atkins, undated. Watercolor, pen and black ink on paper; 10¼ by 14¼ inches. Yale Center for British Art, Paul Mellon Collection. 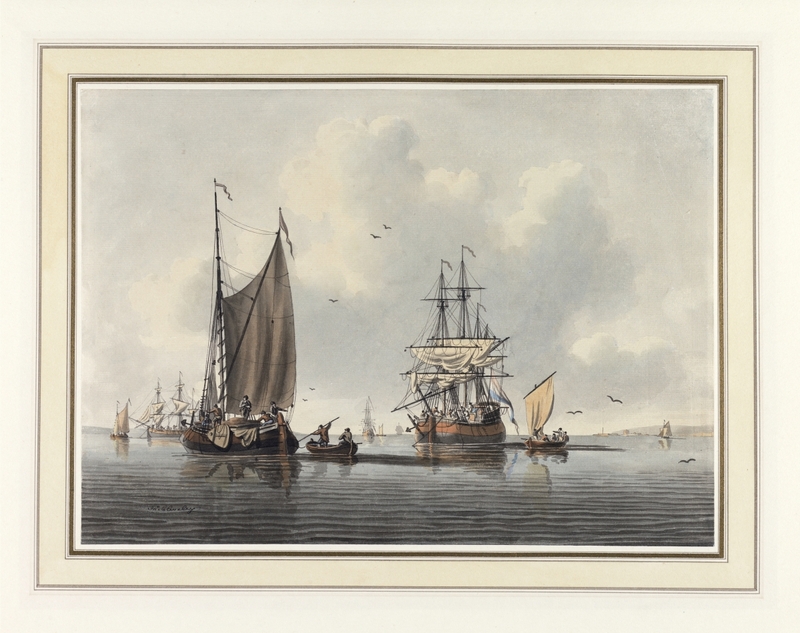 “A Lugger and a Smack in Light Airs” by Charles Brooking, circa 1750. Oil on copper, 7 by 10 inches. Yale Center for British Art, Paul Mellon Collection. Small and exquisite, as Hughes describes it, Brooking’s painting anticipates by 50 years the interest in light and atmosphere often associated with Constable and others. “A Smack Under Sail in a Light Breeze in a River” by Charles Brooking, between 1756 and 1759. Oil on canvas, 14½ by 2½ inches. Yale Center for British Art. Paul Mellon Collection. Brooking may have painted himself on the cutter-rigged smack or cargo hoy, center. More than most of his contemporaries, the artist was interested in mood and atmosphere. “A Geometrical Plan, and West Elevation of his Majesty’s Dock-Yard, near Plymouth, with Ordinance Wharfe &c.” by Pierre Charles Canot, after Thomas Milton and John Cleveley the Elder, 1756. Engraving on paper, 18¾ by 25-7/8 inches. Yale Center for British Art, Paul Mellon Collection. 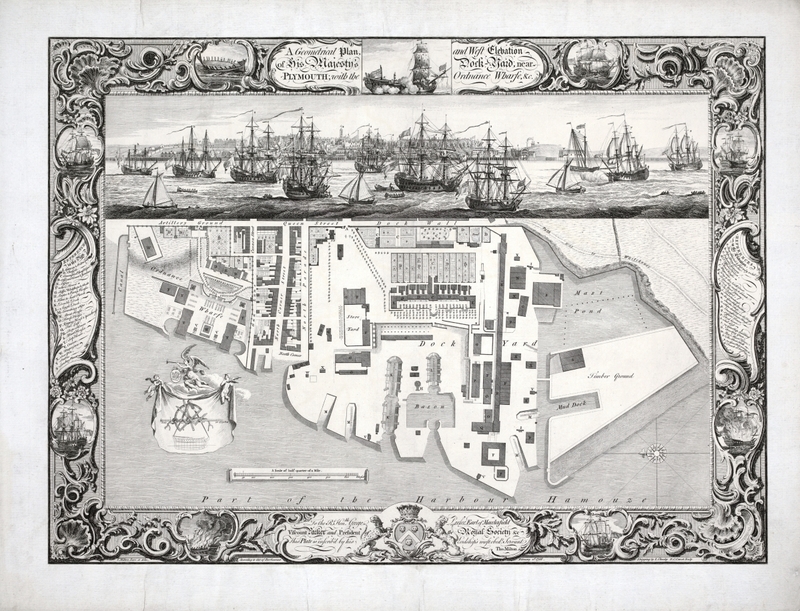 Other engravings from this series depict the Royal Dockyards at Deptford, Woolwich, Sheerness, Chatham and Portsmouth. The Lords of Admiralty visited the sites in 1749. The images seem to have been part of a subsequent promotional campaign. 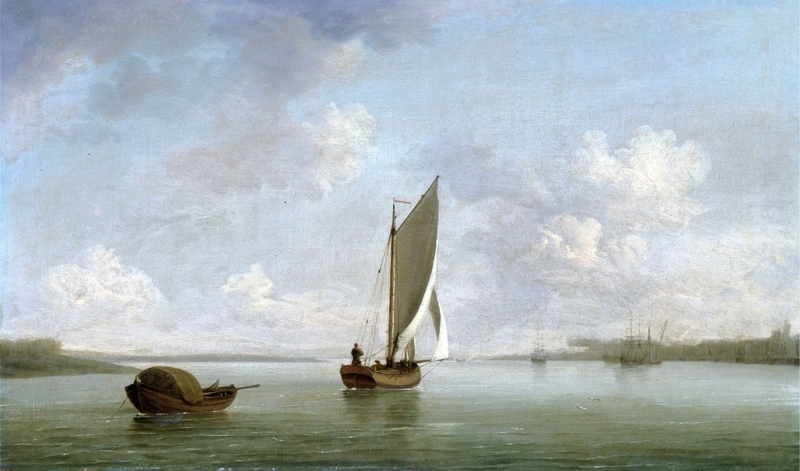 “A Calm Day in the Anchorage” by John Cleveley the Younger, undated. Watercolor, graphite and pen and gray ink on paper; 10¼ by 14¼ inches. Yale Center for British Art. Model of the Coronation, maker unknown, 1677. Boxwood, gold leaf, japanning, mica, brass and varnish; 49 by 22 by 53 inches. The Kriegstein Collection. This model, rerigged in 1920 but with of its original fittings intact, preceded the construction of the ship Coronation in Portsmouth dockyard by Isaac Betts. Launched in 1685, the Coronation sank off Plymouth in 1691 and was recovered in 1977. 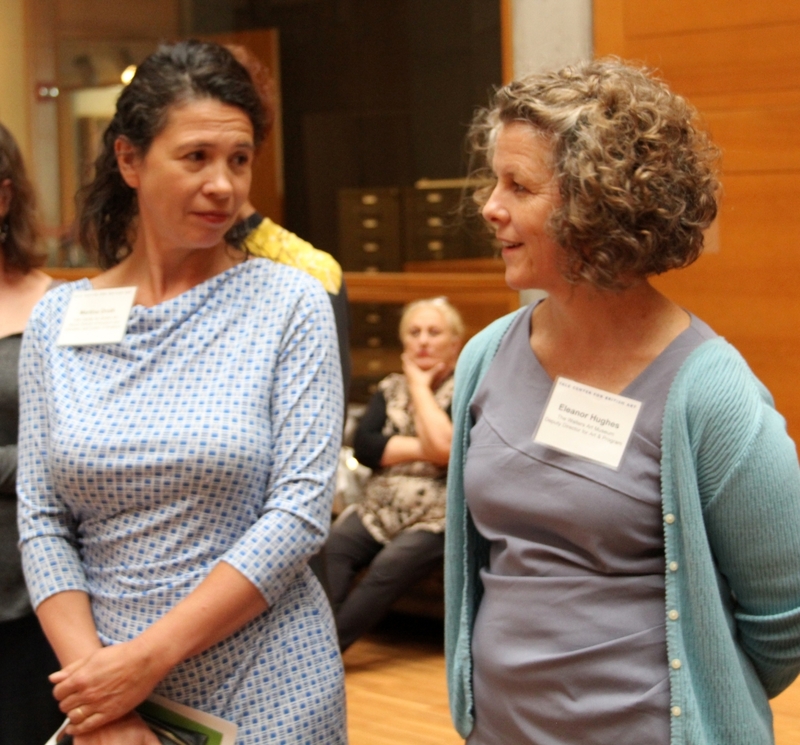 Exhibition curator Eleanor Hughes, right, began work on “Spreading Canvas” while still at the Yale Center for British Art. 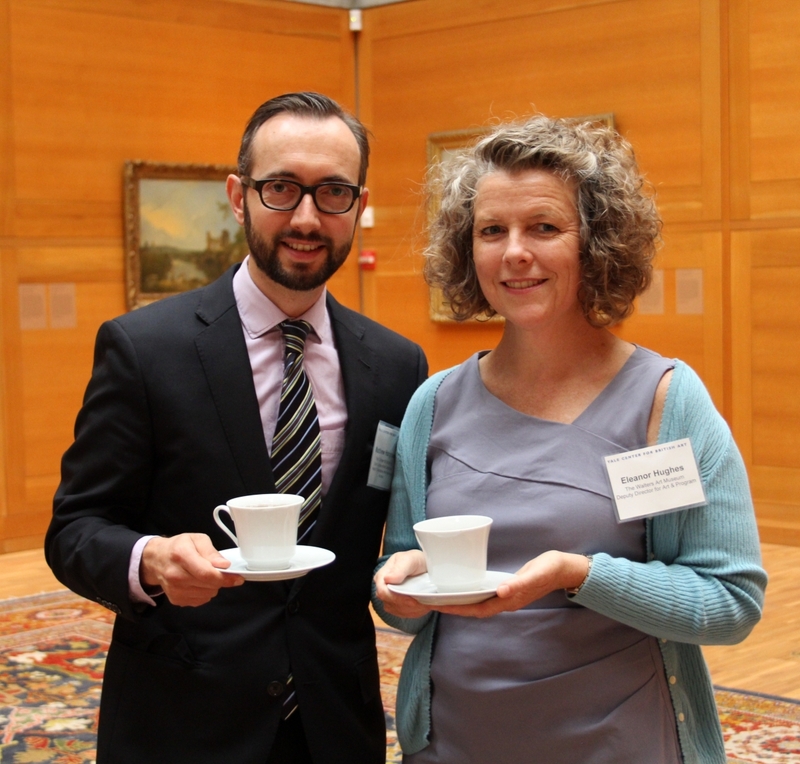 Now deputy director for art and programs at the Walters Art Museum in Baltimore, Hughes was assisted in New Haven by the show’s organizing curator, Matthew Hargraves, left, chief curator of art collections at YCBA. Martina Droth, left, with “Spreading Canvas” curator Eleanor Hughes, organized “Yinka Shonibare.” The vibrant companion show at YCBA reprises an installation on the theme of Admiral Nelson created by the Anglo Nigerian artist for Trafalgar Square. 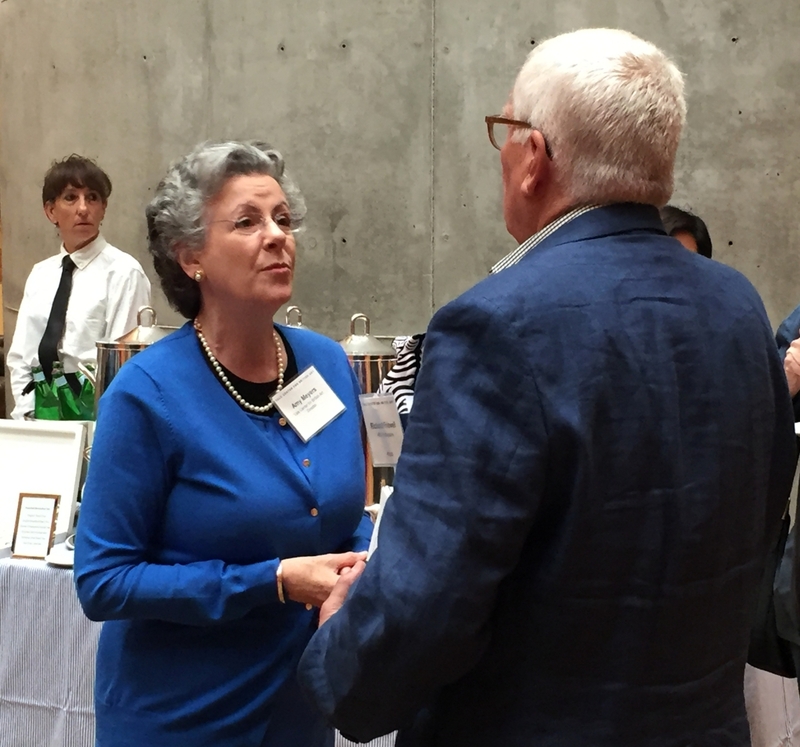 Droth is deputy director of research and education, and curator of sculpture at the Yale Center for British Art. 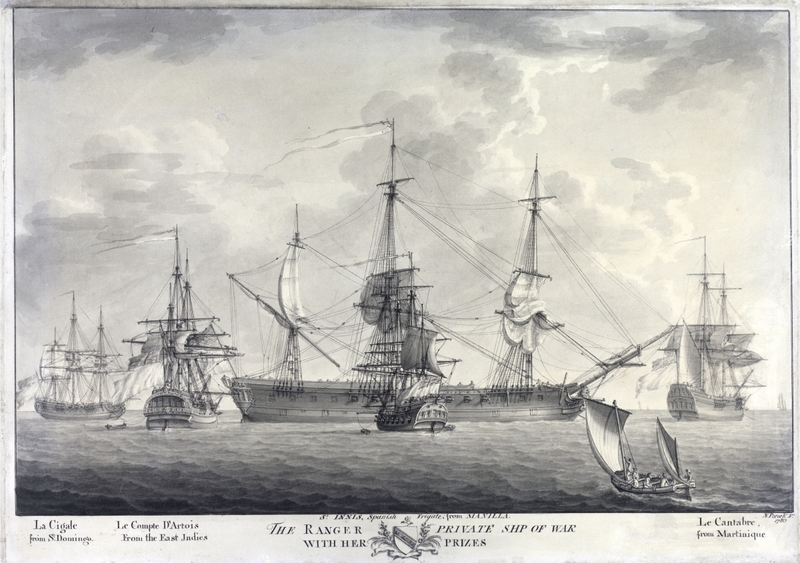 “The Ranger, Private Ship of War, with Her Prizes” by Nicholas Pocock, 1780. Pen and black ink over graphite with gray wash on paper, 18½ by 23¾ inches. Yale Center for British Art, Paul Mellon Collection. The Ranger was an American-built, Bristol-based privateer co-owned by the slave trader James Rogers, whose arms embellish the drawing’s bottom border. Pocock began drawing ships while working as a mariner and captain. “A View of the Tower of London, Supposed on His Majesty’s Birthday” by Samuel Scott, 1771. Oil on canvas, 39¾ by 76 inches. Yale Center for British Art, Paul Mellon Collection. 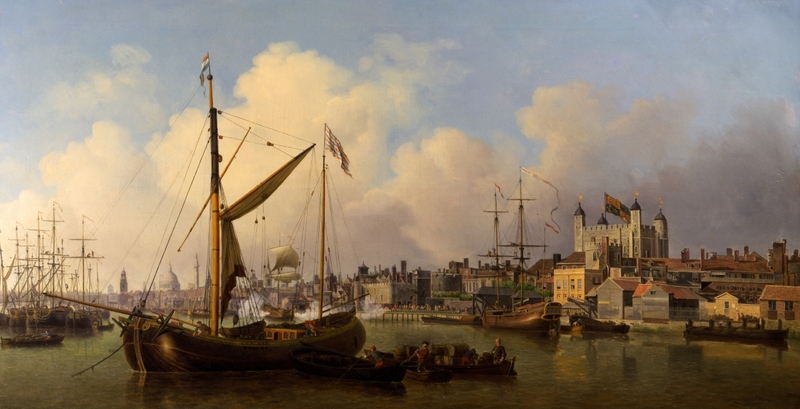 Scott exhibited this view of London from Bermondsey, on the south bank of the Thames, at the Royal Academy in 1771. The dome of St Paul’s Cathedral is visible, left; the Tower of London, right. “Vice Admiral Sir George Anson’s Victory off Cape Finisterre” by Samuel Scott, 1749. Oil on canvas, 40 by 71 inches. Yale Center for British Art, Paul Mellon Collection. Admiral Anson was elevated to the peerage after this victory over the French. Scott documented the battle in three known works. This one, housed in a spectacular frame possibly made by Isaac Gosset, might have been the centerpiece of a commemorative display at the Anson family seat, Shugborough. 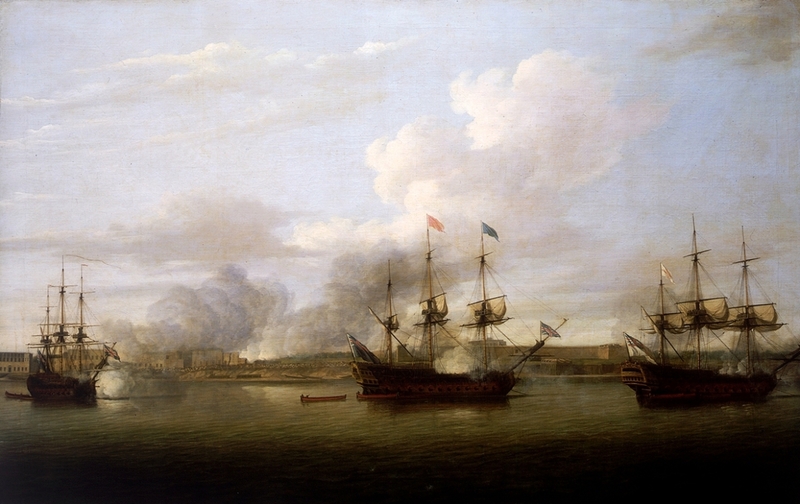 “The Taking of Chandernagore by the Admirals Watson and Pocock, March 1757” by Dominic Serres. Oil on canvas, 45 by 72 inches. National Maritime Museum, Greenwich, London, Greenwich Hospital Collection. Chandernagore was a French fort and, later, administrative center in Bengal, 20 miles from Calcutta. Seizing it, writes John McAleer, was England’s first step in consolidating its commercial dominance of the region. 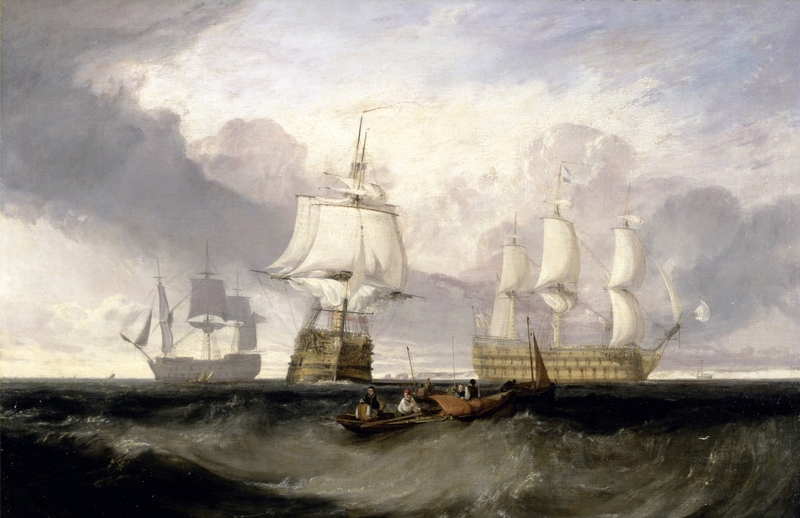 “The Victory Returning from Trafalgar, in Three Positions” by J.M.W. Turner, circa 1806. Oil on canvas, 26-3/8 by 39 ½ inches. Yale Center for British Art, Paul Mellon Collection. Horatio Nelson died aboard the Victory in the Battle of Trafalgar. Turner shows Nelson’s flagship – minus the damage sustained in battle — from three perspectives, a standard convention in marine painting, as it returned to Gibraltar with the hero’s body. According to Christine Riding, Turner had sketched the Victory as it entered the River Medway in December 1805. 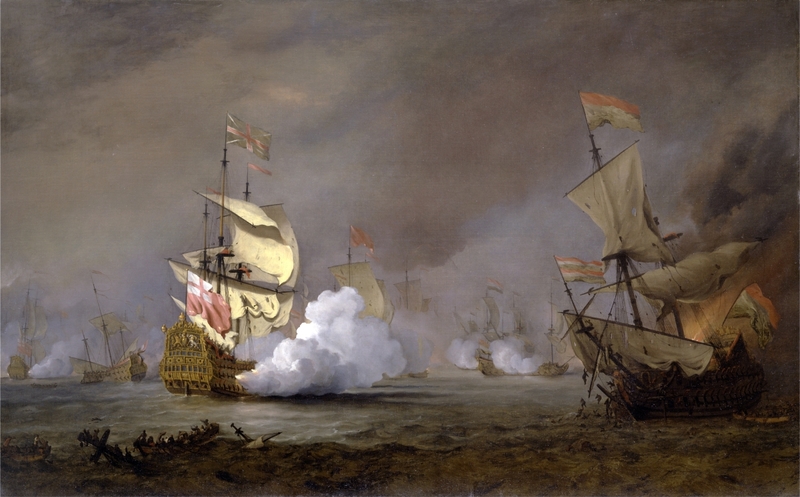 “Sea Battle of the Anglo-Dutch Wars” by Willem van de Velde the Younger, circa 1700. Oil on canvas, 44 ¾ by 72½ inches. Yale Center for British Art, Paul Mellon Collection. This generalized view conflates details of what appears to be the 1673 Battle of the Texel, which pitted the English and French against the Dutch. By the early Eighteenth Century, the younger van de Velde ran a studio operation reproducing versions of earlier paintings for a growing market, writes Pieter van der Merwe.